Finding inexpensive towels for nail salons that stand up to harsh chemicals, heavy use and repeated washings is a challenge for every salon owner. 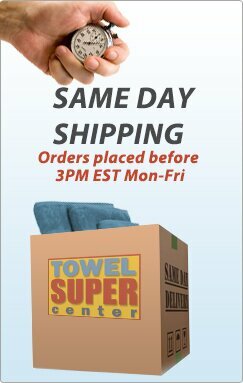 The good news is that finding pedicure towels for your salon and spa at wholesale just got a little bit easier. 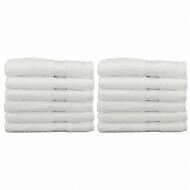 At Towel Super Center, we provide salon hand towels in bulk sizes at incredibly low pricing — browse and see for yourself! Fingertip towels. Fingertip towels, generally 11 inches by 18 inches, are a versatile option for nail salons. Nail technicians can use these towels to wipe clients' hands and feet while doing manicures and pedicures. Washcloths. 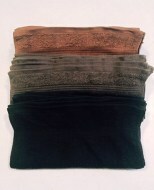 Washcloths come in a variety of different sizes, including 11-inch, 12-inch and 13-inch squares. 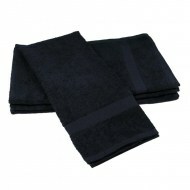 This type of towel can be useful in cleaning tanning beds, as well as manicure and pedicure tools. Handtowels. 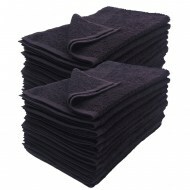 Place handtowels in the bathrooms of a salon, or use them to wipe down salon surfaces. 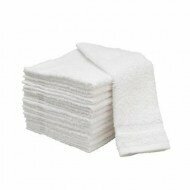 We offer handtowel widths of 15 and 16 inches and lengths of 25 to 30 inches. Body towels. Body towels are essential for tanning salons. Clients can use the towels before and after entering a tanning bed. We offer body towel widths ranging from 20 to 27 inches and lengths from 40 to 54 inches. Here is what you need to know about buying and caring for towels used in nail salons and tanning salons. Nail and tanning salons are going to use a lot of towels every single day. Salons can buy retail towels, but this is not the best strategy. 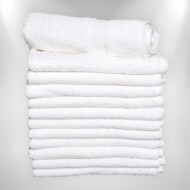 Here are just a few of the reasons why it makes more sense to purchase wholesale salon towels. Uniform look. Wholesale nail salon towels and wholesale tanning towels are available in a wide variety of size options and colors, which allows salons to purchase all the towels they need with a uniform look. Instead of trying to match colors and sizes from different retail sources, the wholesale approach ensures salons have just what they need without unexpected variety. Mixing up towel colors can be fun, but matching specific colors and sizes creates a more professional look than a haphazard mix of towel shades and styles. It might seem like a small detail, but the overall look of your salon and the tools you use do make an impression on clients. Plus, you can select colors that elicit specific feelings in your clients. For example, if you want them to feel refreshed, try a shade of green, or if you want to evoke a calm sensation, try lavender. Cost-efficiency. Salons have a bottom line to worry about. Nail and tanning salons need to pay for the physical space of their business, their employees, taxes, marketing, maintenance and supplies. Supplies, which include things like towels, account for 2 to 8 percent of a salon's expenses. Business owners know every penny counts, so making cost-effective purchasing decisions is important. When it comes to buying towels, it is more cost-effective to buy wholesale than retail. 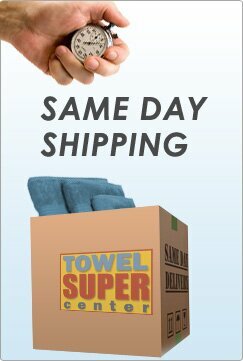 When you buy wholesale, the more towels you buy, the more money you save. Even if you only buy a dozen towels, you will save money compared to retail prices. When you buy even more towels, the savings increase. 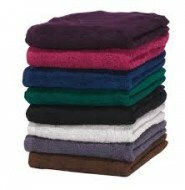 You know you are going to use a significant number of towels at your salon, so buying in bulk makes sense. Plus, towels are something you can keep on hand indefinitely. You can order more than you need immediately, so you will have a ready supply always at your fingertips. Durability. Salon towels have to undergo a lot of washing. After each customer use, the towel has to go through the laundry. Plus, tanning salon and manicure towels are going to come into regular contact with potentially staining chemicals and liquids. You want to pamper your clients with soft, comfortable towels, but you also want these towels to last. Towels made for salons have a rich texture your clients will love, but also the durability to withstand repeated use and vigorous washing. Retail towels not specific to the salon industry will likely fade, stain and become unusable much faster than towels made for nail and tanning salons. Durability keeps your towels looking fresher for longer, and ensures you do not have to spend unnecessary money refreshing your towel supply. Look for options — stain-resistant manicure towels, for example — that offer another layer of durability. Customization options. Different salons have different needs. Whether you're looking to buy body towels or pedicure towels wholesale, nail and tanning salon owners can browse a wide variety of options. Choose the colors, fabrics and sizes that meet your salon's needs. 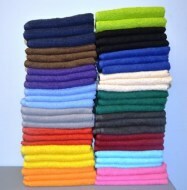 Maybe you want all your salon's towels to be a single color, or maybe you want a mix of colors. You also have the option of different fabrics like cotton, grommet, terrycloth and velour. Each fabric has benefits such as absorbency, softness and stretch. Finally, you can pick the right size to go along with the color and material of your towels. 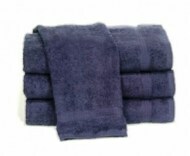 Whether you are looking for royal blue wholesale manicure towels or bright white wholesale body towels, we have you covered. Bleach resistance. Bleach is an excellent cleaning product to use on towels that undergo repeated use and come into contact with staining agents often found in nail and tanning salons. If you use bleach in your laundry, bleach spots will be a major concern. 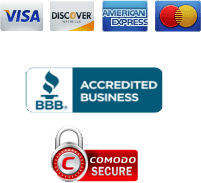 However, you can purchase wholesale bleach-resistant towels in a variety of different colors. You can wash these towels with color-safe bleach and not have to worry about ruining the appearance of the fabric. You do not want to offer your clients bleach-stained towels. Rest easy knowing you can effectively clean your towels and maintain their bright colors. Client satisfaction. Clients come to nail salons and tanning salons to get pampered. Every little detail matters, from the lighting and the decor of your salon to the supplies and towels you use. Everything a customer experiences at your salon is part of your brand, which is essential to maintaining and growing your business. Nail and tanning salon towels can be an effective part of that brand. Towel colors that match your decor make a pleasing visual impression. Soft towels that feel nice to the touch make clients feel comfortable while they get their manicure or pedicure and before and after their tanning session. High-quality towels can last up to 10 years in the home. Nail and tanning salon towels undergo more frequent use than towels at home, but with the proper washing and drying care, they can last for years as well. Here are a few helpful tips for prolonging the life of your salon's towels. Wash before use. 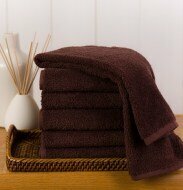 Washing before the first use is the first thing you can do to ensure your quality towels last as long as possible. Many brand-new towels come with some sort of finish, such as silicone. This finish helps protect the fabric from moisture during its shipping journey. Once the towels are in your hands, you can wash and dry them to remove this finish and ensure your towels will be absorbent and soft for your clients. When you do wash your towels the first time, it is important to follow all of the proper steps for different fabrics and colors. Read the label. Reading your towels' labels is the best way to start the washing process, the first time and each subsequent wash. The label will have specific care instructions that, if you follow them, will keep your towels soft, clean and bright for much longer. The small symbols on the label will tell you what water temperature to use, what cycle to select on your washing machine, what bleach is safe to use, what dryer settings to select and what iron settings to use. Know these basic wash symbols, do a quick check of the label before starting the wash process and stick to this routine. Your towels, and your bottom line, will thank you. Know your fabrics. Your label is a great resource, but you should also be familiar with the different types of fabric. Many salon towels are made of 100 percent cotton. This type of towel can handle hot water and repeated washings. 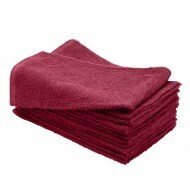 If you are using absorbent terrycloth towels, you might want to use gentler wash and dry cycles. Terrycloth has loops of fabric that can snag in the washer or dryer. Stick to cold water and a delicate wash and dry cycle. Velour is a sumptuous fabric that feels similar to velvet. While it can provide your clients with a luxury experience, you'll need to be a little more careful during the washing and drying process. Pretreat any problem areas with gentle detergent. Wash in hot water and dry on a tumble cycle to help the towel keep its natural shape. Separate lights and colors. You might have more than just towels to wash at your salon, but stick to a towels-only load. This practice is ideal for sanitary reasons, and it allows you to pick the best wash and dry settings for the towels. Once you have all your towels ready for washing, separate them into whites and colors to prevent color bleeding. Your whites will stay white, and your colors will remain bright. Your white towel loads might also benefit from non-chlorine bleach. Avoid odors. You can do some of your towel care even before putting the towels in the washing machine. When towels get damp, whether from wiping manicure and pedicure clients' hands and feet or from tanning salon clients drying off, take immediate action. Do not leave these wet towels crumpled for hours, or you will give mildew, a common culprit of towel odor, the opportunity to form. Spread wet towels out to dry, then toss them in a hamper to await washing. You can also spray your towels with a light mist of herbal-infused water or store them with a bar of scented soap to give them a light, fresh scent. Avoid fading. When it comes to fading, there are a few helpful prevention techniques. Pretreat stains that could affect color before running the towel through the washer. Use cooler water, which is much less likely to affect colors. Finally, always opt for color-safe bleach, even if you have bleach-resistant towels. Color-safe bleach is still tough on stains and mildew, but gentle on colors. Use the correct washer settings. Washing your salon towels after every use is a no-brainer, but each time you do a load of towels, you want to be sure you are selecting the correct washer settings. The heavy-duty washer setting is typical for towels, but always check your labels to be sure. If you notice your towels are particularly dirty, add an additional rinse and spin cycle. Do a quick sniff check when your towels come out of the wash. Do they smell like mildew? If there are any lingering odors, run them through the wash again. Watch what type of products you use. 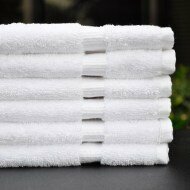 What products you use on your towels is another key part of proper care. Whatever detergent you decide to use, be careful not to use too much. Overloading your towels with detergent can make them feel stiff and uncomfortable. If you are concerned about odors, try adding white vinegar and baking soda to the wash. They won't affect the feel of the fabric, and together they can eliminate some very tough smells. If possible, avoid using fabric softener and dryer sheets. Both of these products can add build up on towels over time and decrease their absorbency. If you feel fabric softener is important, consider using it every few washes, rather than every time. Know how to dry your towels. The drying process is just as important as the wash cycle when it comes to keeping your salon towels as good as new. When your towels come out of the wash, they are likely crumpled in a wet ball. Give them a quick fluff before you toss them in the dryer. This will help them remain absorbent and fluffy. You can also use dryer balls, or even tennis balls, to continue the fluffing process throughout the drying cycle. Towels are likely to generate a fair amount of lint, so you can also run the dryer with nylon netting in the load to catch a good amount of lint. Remember to clean the lint trap, as well. Finally, when you are ready to take your towels out of the dryer and fold them, double-check that they are completely dry. Any amount of moisture could encourage mildew growth. If you are looking to buy towels for your nail salon or tanning salon, browse the multitude of color and size options at Towel Super Center. We have the right style, quality and wholesale prices to meet your needs. Order the towels that will help keep your customers happy and your salon running smoothly.